Some twenty years ago I scavenged fir molding from a house that was going to be torn down. I needed the molding to replace missing pieces of molding in my home. This particular style and age of molding matched what I was missing. As I rummaged about the house looking for the longest sections of molding, I came across a denim coat left behind by some college student. It fit me and it seemed perfect for a work jacket. A few snaps already didn't close properly and the cuffs seemed a little worn. I still grab it on chilly mornings and head out to trim bushes, saw tree branches or mow; I don it fondly. Either the day heats up or I heat up and soon the jacket is tossed aside or like last week hung on a faucet handle on the corner of the garage. Yes, that scavenged jacket is still my work jacket twenty years and counting. I wore the jacket while I trimmed the willow branches so that they would be high up off of the garage roof, where they had been dragging for the last few years. As I snipped, sawed and ducked back and forth to eye the effect, I thought about how distracted I have been for many years and how glad that I am back to be in a more attentive state. Oddly enough the the task of pruning the willow and the passage way is like writing a message to you in tree. I haven't been oblivious to the tree's branches laying across the roof and cascading down into the passageway that leads to the stream, but I had been feeling reluctant to open up the stream area. I liked it being so private. When I would notice the branches dragging on the roof tiles, I casually worried about the damage the branches might do to the roof, but not worried enough to take away my feeling of wanting to be cloistered. Somehow I was asking the tree to guard this sacred ground, my space out of the eye of the public, while I struggled with work, with care taking and death. Company would come, children would visit and often they were puzzled about how to get to the stream. 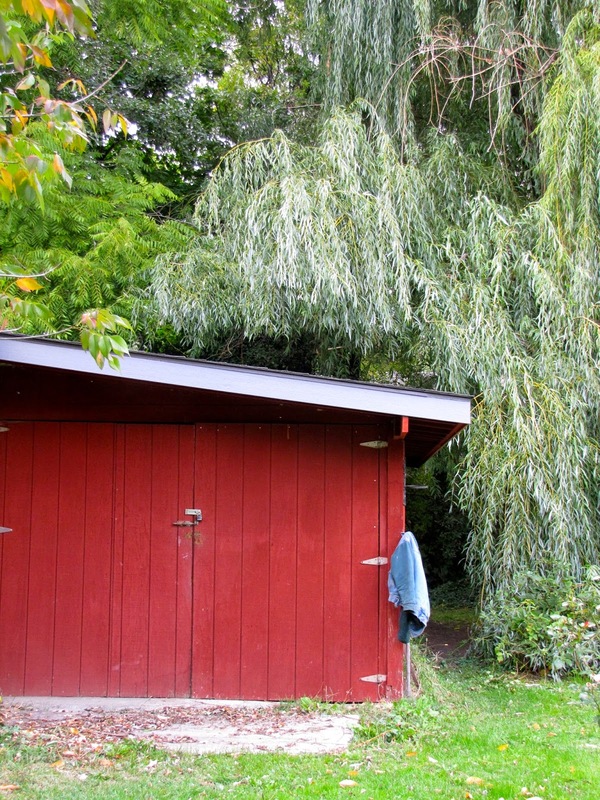 The willow casually waving against the garage didn't easily divulge the passageway. The simple act of radically pruning the willow writes "welcome" in tree. 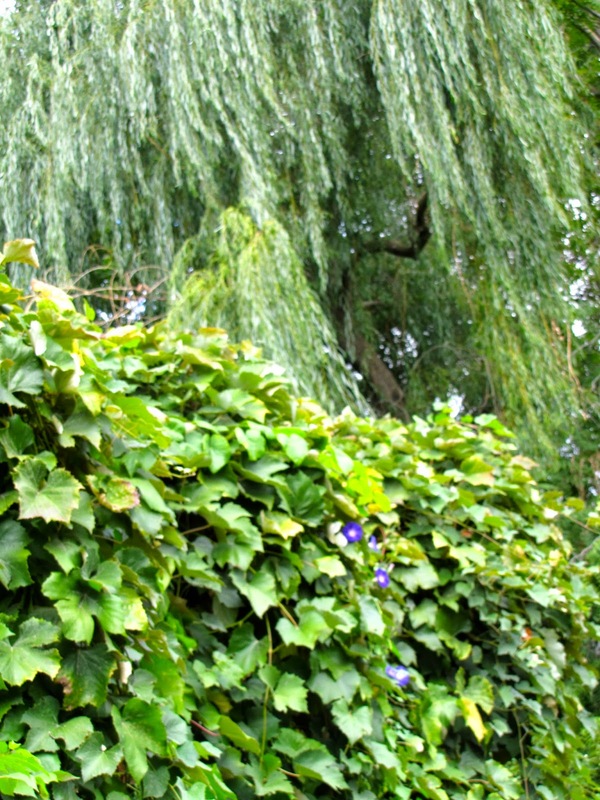 Pruning is a spiritual task. Monks whose service was devoted to tending monastery orchards or the gardeners of Japanese gardens know about the holy work of pruning. As the hands and eyes trace the puzzles of the branches discerning what to cast aside and what to keep, the mind does the same. My worries and problems have been carted to the garden, carefully pruned and tossed on the compost pile along with the branches and twigs. As a novice I concentrated on the task of pruning and trying to make the cuts the right ones. As the years passed the motion of gathering the tools, sharpening the blades, and donning the jacket and gloves became the ritual that would set my mind to working. *When overlapping twigs rub across each other causing wounds on their bark, this is not dissimilar to the cross purposes in my life that left abrasions on my heart or wrecked havoc with my intentions. Choosing which purpose was healthier and worth keeping was a worthy task of the mind. *Trimming inward growing branches opens up bushes to light and air, much like cutting through dark thoughts allowed myself to be open to fresh and illuminated visions. * Cutting branches in such a way that the shoot remaining will grow in the direction that will best suit the shape of the plant is not unlike intentionally finding the right action to shape an outcome. *Pruning roses to the first outward growing group of five leaves demands careful attention with each cut. Attending to the precise number of actions that were necessary to wend my way out of some tangled mess took similar focus. Apologize, admit to error, identify my responsibility, consult again and make amends. Five. Almost always five actions. Count, snip, count, snip. *Culling fruit or nuts from over-laden branches keeps the branch from breaking under the strain. Thinking about my behavior and moderating it prevented me from the problems of overindulging. As I slip my old and rough denim jacket about my shoulders, I feel like I am putting on my holy coat. I prepare for a day of pruning branches, worries, grievances and problems. My hands slip into my holy gloves. I have had so many pairs of gloves, but I invariably lose the right-handed one. When I want to feel what I am doing, I strip off the right glove. Most garden gloves, even those in size small aren't small enough for my hands. I can't feel with the empty fingertips, so off comes the glove. Those right-handed gloves disappear at an alarming rate. Covered by dirt, dumped into the compost or garbage or hidden in a pile of leaves they are off and gone. Except this green pair. They are the only gloves that fit tightly and remain a pair. As you can see they are my holiest gloves! These holy gloves have seen me through many hours of pruning and meditating on life's branching tangles. I hope to soon find a replacement pair. Holy ones. My garden shed is the shrine for the holy gloves and tools. 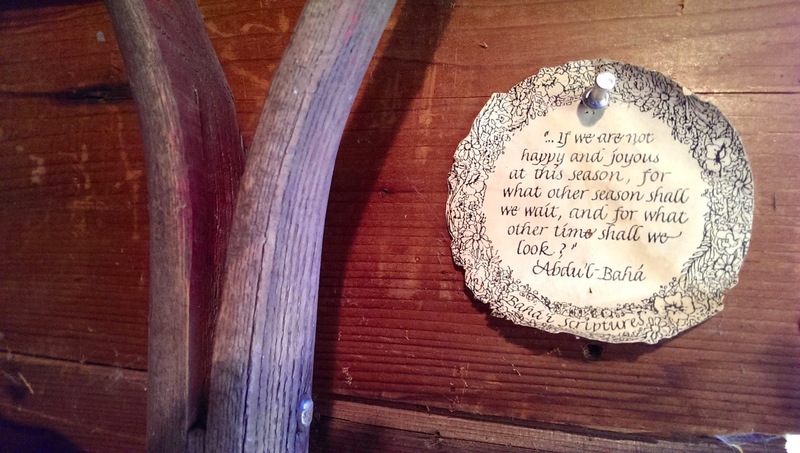 Over the years the shed has acquired a Buddha head and a small circular posting of a prayer. Blanche Graff had been a dear friend and a gardner until she turned 99 years old. That black and white photo of an older lady in my opening post page is Blanche. When she moved away from her house and gardens she gave me her pruning wheel (ha, sounds like a prayer wheel!) and a prayer on a little circle of paper edged with a flower design The prayer had hung on a post near her tools.. The prayer is a one from the Baha'i Faith. It says, "...if we are not happy and joyous at his season, for what other season shall we wait, and for what other time shall we look?". Abdul Baha' Pruning is a year-long task. Trees are best pruned in the winter. The prayer is a good prayer for gardeners, those holy pruners season in and season out.